I was wondering if Affinity Photo was capable of handling OCIO context variables? It's quite common in the film industry to define context-driven colorspace(s) in the OCIO configuration. Either by having a variable part in the search path, or directly in the name of a LUT/CDL file. Theses variables can be then set to different values at runtime and force updating the resources loaded by OCIO processor(s). 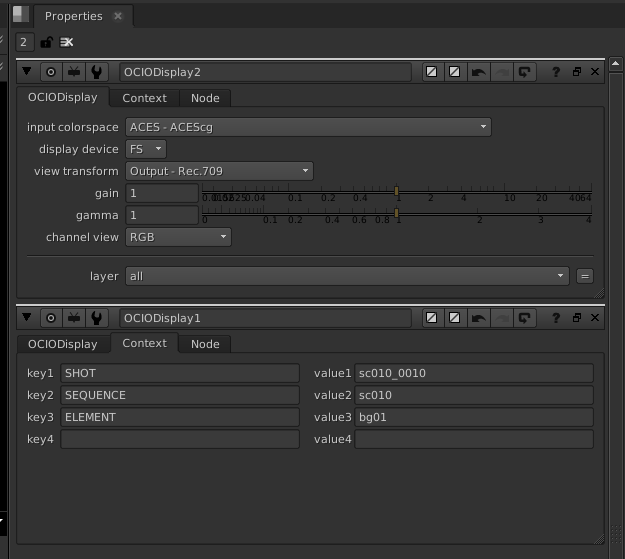 An example of this being implemented at the user-level is Nuke OCIODisplay and OCIOColorspace nodes that expose a "Context tab" where you can define key-values where the key is the name of variable and value the literal value (e.g. SHOT sc010_0010). I'm happy to elaborate more if needed be. My knowledge about OCIO is very limited but we do support a OCIO workflow, i'm not sure if it matches everything you are looking for, but this page in our Help explains a bit more about how we do things. Might be worth checking out the 10 day trial from here and you'll be able to have a play around with the OCIO options. I actually have a license of Affinity Photo and did went through the documentation and online videos. From what I see, the configuration is evaluated once and the interface only gives access to the Display transforms (as a combo-box selector in the 32-bit preview panel) and colorspaces (as a correction layer that applies a colorspace conversion). If Affinity Photo had a scripting API and was exposing the current OCIO configuration, I would be able to update the variables through a script but I don't believe that's an option for now. Thanks for the extra information @dsideb as i said, my knowledge in this area is limit, so i appreciate you explaining how we could improve things.